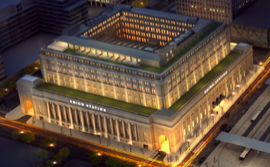 Advocates for preserving Chicago’s historic Union Station appear to have won a significant battle against developers with a more modern perspective. A revised plan for the redevelopment of the neoclassic building calls for adding only a single-story “penthouse,” which officials promise would not be visible from street level. This comes instead of a modern seven-story glass and steel addition that developers — hired by Amtrak, the building’s owner — had proposed in June. That 404-apartment addition was scrapped after a torrent of opposition from preservationists, railroad fans and architecture critics. At a meeting in the station’s restored Burlington Room Tuesday evening, developers unveiled the latest plans for the building, along with a proposal for a 715-foot, 1.5 million-square-foot office building with an attached parking structure and a 1.5-acre park, to be located on the block south of the station. The penthouse would be atop two separate hotels totaling 400 rooms. These hotels would be built within the existing fifth and sixth floors of the building. The penthouse will not be visible from the street, insisted officials with Chicago-based Riverside Investment & Development and Convexity Properties. They backed up this promise with a sight-line diagram showing how the penthouse would be set back and screened from view.